First thing, this is on Windows Vista only. I have not tested on others but have been told it works on XP also. WARNING: I will not be responsible for anything happening or going wrong with your PC because of these instructions. Using these instructions you will be able to set up a local working copy of phpBB’s development repositories. 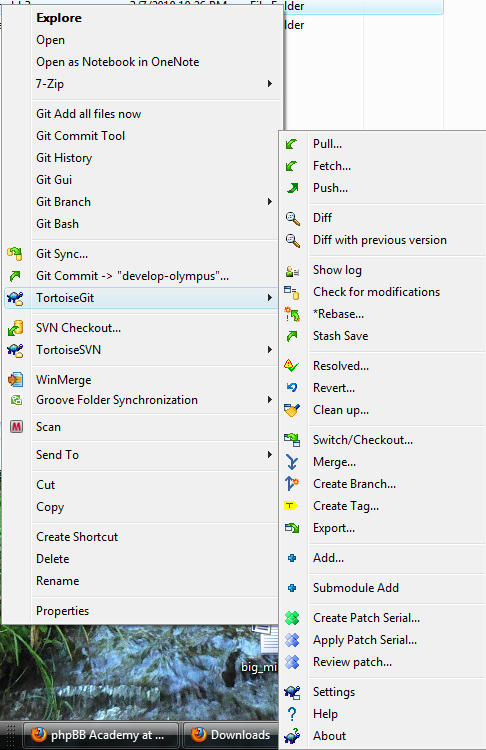 You will also have some new commands for command line and Git installed on your Vista PC. 1. The first thing you do is set a restore point in your Windows System so you can clock it back if you have to. 2. You will need to download some packages. These must be installed in the order I have listed. Download the latest of both. 3. Installing msysgit Install this first! They are not needed for our setup because we will use a better solution tortoisegit, but they are optional and may have uses. You may not want those extra options in the context menu to save room. As you see a few images down it can get quite long and as I said they are not needed. The image above is an important one. I suggest you select the one I have selected with the warning. 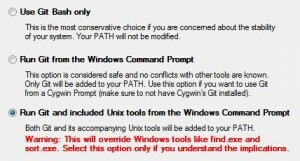 Those couple Windows commands that you didn’t even know were there will get replaced with commands we need. Like generating SSH Keys and using Git right from command line and you will need this! Putty didn’t want to work for the keys needed and I got sick of fighting, this is the best solution. The above image is very important. That is the setting you want. The rest of the install is obvious. 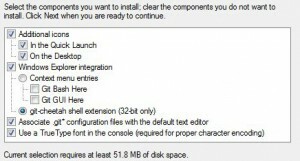 After the install you should have some tools that look like this in your right context menu. 5. Setting up a copy of the phpBB git repo. You will need an SSH key pair to work with this repository. 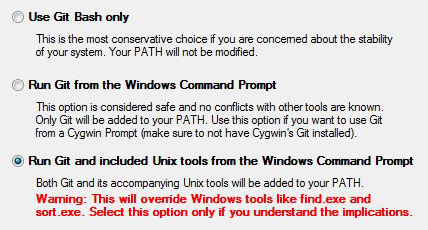 Since we added the Unix tools to our command line this is easy. Go to your C: drive or what ever drive your Windows is installed in. Hover over that folder press Ctrl + Shift keys and right click all at the same time. 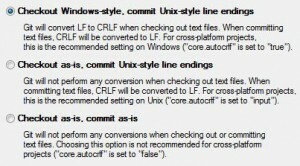 This will force an Open command line here in the context menu. Then Enter and close the command line. Enter a passphrase which will return Enter same passphrase again: enter it and hit enter. Now close that command window. Open your .ssh folder and open the id_dsa.pub with notepad or another text editor like NotePad++Copy the entire content of that file and use the Add a Key on GitHub and paste it in for your public key. Make sure your firewall allows access to the access keys in the .ssh directory. This part works best with Command line because of branches. This will initialize the folder and then ask for your pass phrase then it will download the remote objects. This part will take some time with 90274 objects depending on your connection speed, mine is not that good. Note: I apparently didn’t have my fork set to Master by default which is why I ended up with that branch. On GitHub when viewing your fork select the Admin button and you can change these settings. You now have a clone of your fork. Any changes that you make to this repo and push back will show up for the phpBB development team and they can decide on if they want to use it in phpBB. You should now be setup with your own working copy and repository fork for phpBB. 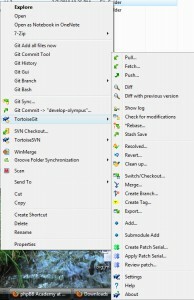 99% of the time you will be able to use TortoiseGit options in your right click context menu, but there may be times when command line is needed.